The use of authentic wood in a home adds an elegant decorative appeal that few other materials can. 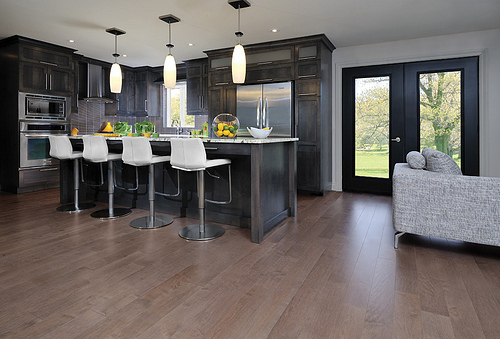 Kitchens are a common room that showcases this design idea in a variety of species. Some of the wood kitchen cabinet design selections will feature oak, pine, teak, cedar, mahogany, and maple. More detailing is available with the fixtures used on the handles and hinges. Gold, copper, and wrought iron are examples of the metals applied to detail cabinets. 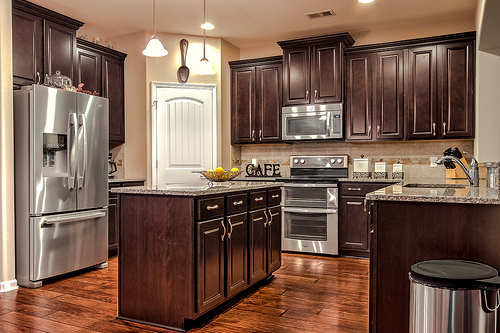 Here is a look at designs, cabinets, and doors to consider during a kitchen update or remodeling project. Some of the swankiest homes in America are found in Manhattan. Owners enjoy an eclectic range of architecture with period features melded into modern ones. Kitchens are a focal point that allows this experiment to thrive. Everything starts with the blueprint. Architects use the client’s vision to create the exact size and storage capacity of cabinets. They do this in order to accommodate the space. Design preferences go even further with versatility and functionality. These will make the space convenient. It is common for entire walls to be lined with tall wood kitchen cabinet doors that reach from the ceiling to the floor. 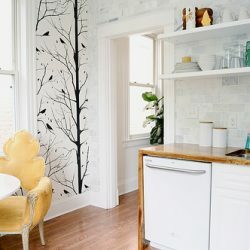 Some unique trends gaining popularity include horizontal draws that run the length of a wall. Wood kitchen cabinet designs with special sections known as Lazy Suzy’s offer owners an ease of use. Standard designs do not offer this. Refrigerated wine racks located in a center island provide quick access to a chilled bottle. No need for a trip to the basement! The possibilities are endless. The possible outcomes are as unique as the individual with the vision. Deciding on the type of wood to use is more difficult than making the decision about the final design. A few varieties have already been mentioned. However, there are several other outstanding choices such as cherry. Cabinets with this species come with medium to dark reds. They also have symmetrical grain patterns. Any wood kitchen cabinet made with mahogany needs very little detailing. 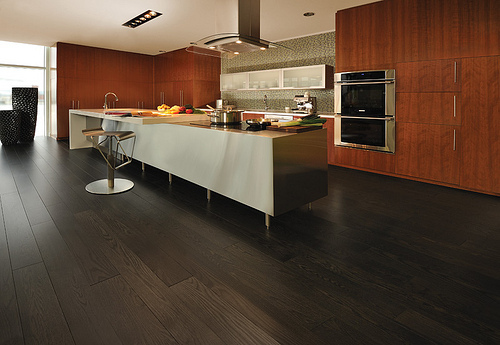 This is due to its deep brown color and decorative grain patterns. Simple fixtures from brushed material enhance their appeal further. This is the priciest option for wood choices due to its declining availability. Suburban homes in Queens often use recess lighting to highlight the natural beauty of this wood kitchen cabinet design. For a budget-friendly selection, pine is an ideal solution. It offers owners a broad array of finishes. These add color to its neutral hue. A clear coat of shellac displays the natural rings and swirls this species is known for. Wood kitchen cabinet doors with pine can also be left untouched to complement a rustic decor. 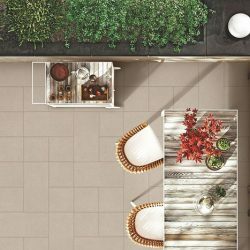 The busy neighborhoods of Brooklyn could take advantage of this styling to upgrade customary kitchens and bring in a country setting. Spruce things up a bit with maple wood for its smooth surface and ability to use rich paints or stains. The border section of doors can be painted a different color from the interior or inlay. This gives them a pronounced look. It appears like two types of wood are being used. Fixtures on any wood kitchen cabinet come with tons of design features. These will add fancy detailing. This includes the size, shape, texture, and finish of knobs and hinges. Some patterns can have the owner’s initials to incorporate a monogram accent. Wood kitchen cabinet doors can move in different directions. These are up, down or out. Choosing sturdy handles with finishes that will not wear off is a prudent idea. Certain finishes such as brass or copper work well with rustic kitchens. Gold and silver fit perfectly with mahogany and maple. For homeowners that purchase pre-fabricated products, they will have limited choices with their wood kitchen cabinet design. However, changing the fixtures is an easy option to personalize every selection. If you are looking to choose the right design for your wood kitchen cabinets, Home Art Tile Kitchen & Bath is the perfect choice. We offer competitive pricing, friendly service and some of the best products you’ll find in Manhattan, Queens and Brooklyn area.